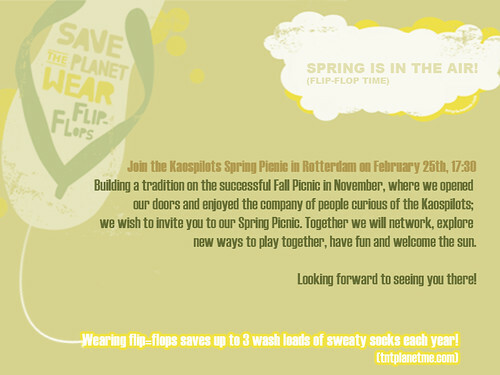 This week KaosPilots team 2 organized a spring picnic, and 31Volts was invited. “KaosPilots is more than an education, it is a philosophy. After their successful picnic in autumn, the pilots just decided again to invite inspiring people and companies, and 31Volts happened to be one of the lucky newly invited. When entering the bright, creative and crowded classroom/living room directly from the rainy street, all visitors were welcomed by a warm applause by the pilots. Team 2, (age between 21 and 27, boys and girls from all over the world) could be recognized by wearing flip flops or sandals, which are said to be more sustainable. Some of the pilots I already met during the ‘innovatieproeftuin‘, like Unnsteinn from Iceland. And Gert happened to originate from the same faculty I studied until 2007, Industrial Design Engineering. Service Design in a box? Several warming up rounds and ‘checking in’ ceremonies later visitors and pilots were engaged in discussions about different topics, varying from a ‘social photo project’, to ‘getting drunk near the heater’, to ‘spontaneous expression’. I had an interesting short discussion with Nathaniel from Canada, about how to ‘sell our profession in a package’. Comparable with explaining service design, the Kaospilots sometimes feel that only a short explanation is not sufficient to express their philosophy. Could we somehow ‘put service design into box’, or ‘fit KaosPilots into a product’ for direct sell & use? The pilots I met that evening did understand the value of service design immediately, and were quite interested in this design field. Kaospilots are looking for team 3, more design thinkers, yes! It was wonderful to have you over and I invite you to an even BIGGER and GREATER party on the 14th of March! Here is: http://kpnlteam2.wordpress.com/2009/02/28/48/ the link to our new blog and there you can find the invitation! Nice piece, glad you enjoyed … we had fun! Hope to see you for our BIG fundraiser on March 14th to help Team 1 on their outpost to Israel/Palestine.